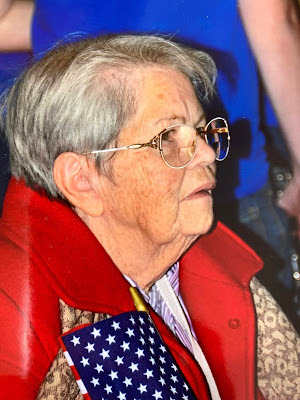 Josephine Irene (Young) Foster passed away Sunday, February 17, 2019 at the age of 95 at the home of her daughter in St. Charles, Mo. She resided there after the death of her husband of 71 years, Paul. She was wrapped in the comfort of one of the many quilts she had made and was surrounded by those who loved and cared for her. She was born January 29, 1924 in Arkansas. Josephine and Paul were married in Yuma, Ariz. on August 5, 1947. They later lived in San Diego, Calif. and Colorado Springs, Colo. before making their home in Houston, Mo. Paul’s career as a bricklayer brought them to St. Louis where they lived and raised their three children; Harley, Sally and Paul Jr. until retirement. Josephine worked as a hairdresser for many years in St. Louis and then retired from Kmart where she was just going to work a few months for some extra Christmas money, but liked it so much she thought she’d just continue working there until she retired. They eagerly returned back to Houston to enjoy retirement and living on the family farm. Josephine enjoyed sewing her quilts and canning any vegetables Paul would bring in from the garden. Josephine was preceded in death by her parents: Harold and Roberta (Henson) Young; Sisters: Beulah, Betty, and Shirley; Brothers: Harold Jr., Edward, and Emmerson; and son-in-law Joel Vaccaro. She is survived by her children: Harley Foster of Houston, Mo., Sally Vaccaro of St. Charles, Mo., and Paul, Jr. of Houston, Mo. ; four Granddaughters: Jessica Vaccaro, of St. Peters, Mo., Amanda (Brad) Malone of St. Peters, Mo., Victoria (Dmitry) Chouklina of Colorado Springs, Colo. and Tara (Josh) Peacock of Wright City, Mo. ; eight great-grandchildren: Taylor, Parker, Preston, Piper, Sofia, Juliet, Leo and Jaxson; brothers: Mackey (Diane) Young and Charles Young. She is also survived my many nieces who were always welcomed when they stopped by to check in on them along with other family members, neighbors and friends. She was a friend to all and will be missed by many. A special thank you for the loving care she received from her caregiver and friend. Services will be under the direction of Evans Funeral Home on Friday, February 22, 2019. Visitation 10 – 11 a.m., Service at 11 a.m., with Jackie Cooper officiating, burial to follow at Allen Cemetery in Raymondville, Mo. In lieu of flowers the family requests donations to the Allen Cemetery Fund- Mary Palmer, Treasurer, P.O. Box 81, Raymondville, MO. 65555. Pallbearers are: Harley Foster, Paul Foster, Jr., Josh Peacock, Brad Malone, Dmitry Chouklina and Mackey Young.